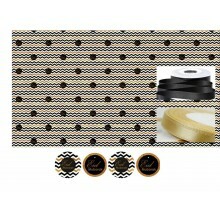 Designer Eid Range - Gift Wrapping Set - Chevron - Eid Mubarak Designer range, modern & exclusive, limited stock. Includes 1 set of Gift Wrapping Paper - Extra Large size (100 cm x 70 cm) 4 round gift cards 4 metre ribbon - 2 metre Gold ribbon / 2 metre Black ribbon. Will make your presents the talk of Eid.